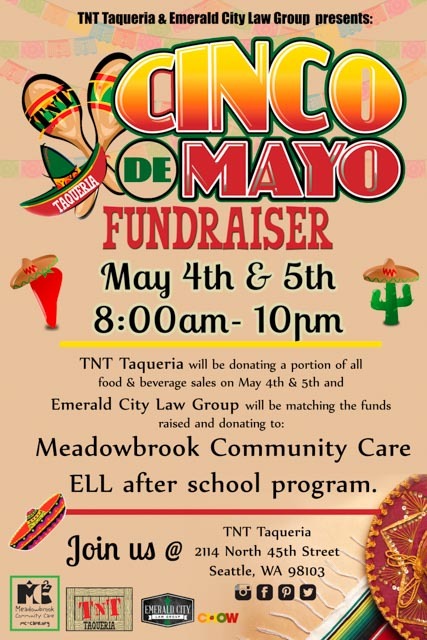 On Monday May 4th and Tuesday May 5th from 8am to 10pm Seattle law firm, Emerald City Law Group (ECLG) will match proceeds received on the Cinco De Mayo Celebration Fundraiser at TNT Taquiera Restaurant in Wallingford. Supporting Meadowbrook Community CARE’s Lake City After School Program will be the focus of the two day fundraising event. ECLG (www.EmeraldCityLawGroup.com) has been a generously engaged partner in helping support those in need in the Lake City community. Originally ECLG initiated its support to the North Seattle community with the Lake City Holiday Project in 2013. Their increased support has its roots in ECLG leadership’s own early history. We appreciate their CARE and the willingness of owner CHOW Foods (www.ChowFoods.com) to be engaged in the needs of the community. Eat More Tacos!